ProAnalyst® is the world’s premier software package for automatically measuring moving objects with video. MREL provides all Editions of ProAnalyst® to the Blasting and Explosives Industries worldwide and includes ProAnalyst® TrackOne Edition with each BlastCam™ High Speed Camera and Blaster’s Ranger™ High Speed Camera sold. ProAnalyst® assists blasters to measure the effects of changes in the blast design such as blasthole diameter, timing, burden/spacing, and stemming on the time of onset, and the velocity and trajectory of rock movement at the top and face of the blast. 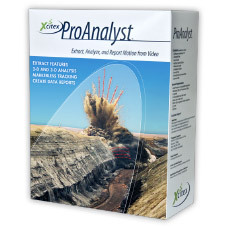 ProAnalyst® allows blasters to import virtually any digital video and quickly measure and track time, position, distance, velocity, acceleration and other rock characteristics within that video. Analysis results can be instantly graphed and reviewed, compared against external data, and can even be exported to PowerPoint® presentations, printer-friendly reports, and HTML web pages to bring your blast design optimization project to completion.